The skies are clear, but the sea is a little choppier than it was yesterday. Some of us, who are prone to getting seasick, have been relying on medicine to help us. The forecast is for rougher weather tomorrow, so everyone is anxious to see what we can get done today. Dwight Coleman is the chief scientist on the ship. He is worried that rough weather may prevent us from using Argus. 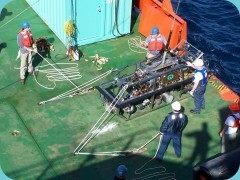 When the weather is bad, it is too dangerous for people to work on the deck of the ship. When that happens, we cannot launch or recover Argus, so the ROV must remain onboard, strapped to the deck to keep it from moving. We are hoping to get Argus in the water to get some underwater images today, just in case we can't use the ROV tomorrow. For about the last hour, the IFE team has been preparing Argus for launch. I'll take some photos and post them later today.